How about a Halloween Decoration Contest to spark the imaginations? Best of Show – You nailed it… I mean you really got the neighborhood talking. 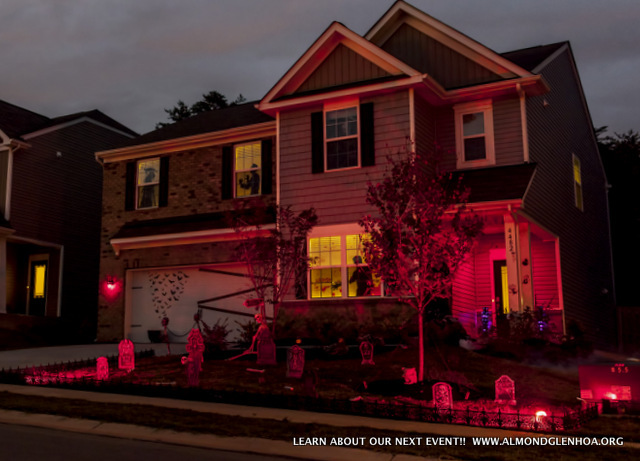 Be it ghastly spirits and spooky sounds or fall colors and decorations from curb to second story windows… you pulled it off. The whole neighborhood can’t wait to see what you do for the next holiday. The bar has been set. Spooky/Scary – This home encompasses all that goes “bump in the night”. Ichabod Crane avoids the entire block just to be safe. Elegant Fall – This home favors fall colors and a hint of “all hallows eve”. Skipping out on the traditional spooks and spirits and instead going for the subtle feel of crisp apples and warm campfires on a cool evening.